Given \(n\) general points \(p_1, p_2, \ldots , p_n \in \mathbb P^r\), it is natural to ask when there exists a curve \(C \subset \mathbb P^r\), of degree \(d\) and genus \(g\), passing through \(p_1, p_2, \ldots , p_n\). 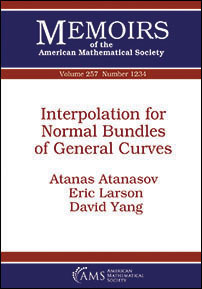 In this paper, the authors give a complete answer to this question for curves \(C\) with nonspecial hyperplane section. This result is a consequence of our main theorem, which states that the normal bundle \(N_C\) of a general nonspecial curve of degree \(d\) and genus \(g\) in \(\mathbb P^r\) (with \(d \geq g + r\)) has the property of interpolation (i.e. that for a general effective divisor \(D\) of any degree on \(C\), either \(H^0(N_C(-D)) = 0\) or \(H^1(N_C(-D)) = 0\)), with exactly three exceptions.